We’re officially well into 2013’s summer blockbuster season and this weekend gives us the most anticipated superhero movie since the last most anticipated superhero movie! 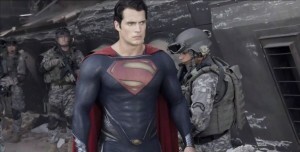 Thirty-five years after Richard Donner’s Superman: The Movie sizzled and seven years after Bryan Singer’s aborted reboot attempt Superman Returns fizzled, comes the latest incarnation of the red and blue spandex-clad alien hero. 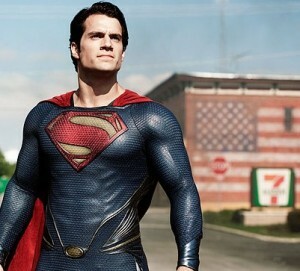 Directed by Zack Snyder (300, Watchmen), and produced and co-written by Christopher Nolan, Man of Steel has been buzzed about for some time now and everyone, well except probably Brandon Routh, will flock to theaters to see if it lives up to the hype. Man of Steel opens with the birth of Kal-El (that would be Clark Kent/Superman) on his home planet of Krypton, a magical place where its residents ride flying dragons and Russell Crowe doesn’t sing. But Krypton is doomed and knowing this, Kal-El’s parents Jor El (the non-singing Russell Crowe) and Lara Lor-Van (Ayelet Zurer) decide to save their son by launching him off in a pod to an inhabitable planet us humans call Earth. 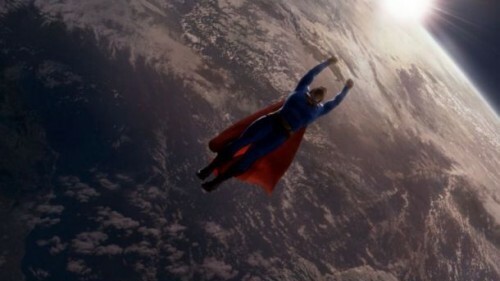 Moments before, a group led by Kryptonian Army General Zod (Michael Shannon) are captured while attempting a coup and are also shipped off into space, sentenced to float around for infinity. Or until they too, land on that blue planet that just may be a perfect location to rebuild Krypton. 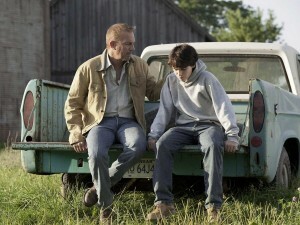 Once on Earth Kal-El is found and raised in a small town by loving and humble farmers, the Kents (Kevin Costner and Diane Lane) who rename him Clark. Clark’s Ma and Pa teach him to have high morals and to control his otherworldly powers so as not to attract attention to himself. That is, until the right moment comes along when he must use his powers for good. 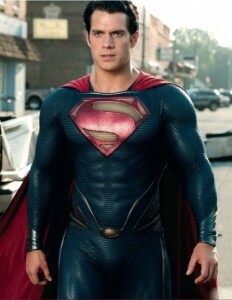 Clark (Henry Cavill) finds this difficult to do and once an adult, must move from place to place in order to keep his identity a secret. One of these places is located in the Arctic where Clark stumbles on information about his past and who he is. But he isn’t alone. Right behind him is ace reporter Lois Lane (Amy Adams) who knows a good story when she sees one; she is a Pulitzer Prize-winning journalist after all (as she reminds her boss and the audience at one point). Lois is determined to find out more about the mysterious stranger. At the same time, guess who’s back to seize control of Planet Earth? Snyder (along with Dark Knight franchise writers David Goyer and Christopher Nolan) succeeds at laying the groundwork for a successful franchise. Man of Steel is completely different than previous Superman movies in its tone and approach, to the point of almost being an anti-Donner/Singer version. Whether that’s a good thing or not depends on the viewer. Regardless of my own opinion on that, I predict it will be enough for this reboot to stick. 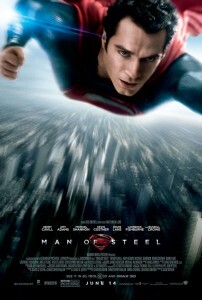 The film takes its time, a good two-thirds, focusing on the origin story of Kal-El, both on Krypton, then Earth. The narrative bounces back and forth between adult Clark taking odd jobs and moving on to the next place before anyone suspects he’s anything more than a really, really buff Good Samaritan and flashbacks of his childhood. The latter scenes were especially well done and for me, the most effective parts of the movie. We see young Clark struggle to not only deal with all the normal trials of childhood like fitting in and bullies but also to learn how to control his many powers at the same time. Sometimes this is shown from his own point of view, and it showcases just how frightening and confusing such a thing would be for a young child. It’s in these intimate scenes where Costner and Lane shine as his parents. Man of Steel is more sci-fi than any previous cinematic telling, but then it makes sense given that Superman is an alien. At times it feels more like a science fiction movie than a superhero one but it worked for me because it added some layers to the back-story. Henry Cavill does a fine job filling the tights (but not the shorts- which are presumably underneath this time around) of his predecessors. Though he never reaches the level of the late Christopher Reeve on the charisma scale, Cavill is certainly the beefiest Superman to date (sorry Dean Cain), which from comments I’ve seen on social media in the last few days is definitely helping to fill theater seats. 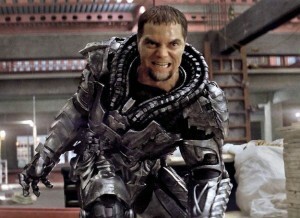 Eye-bugging and teeth grinding Michael Shannon makes a good foil in his General Zod, and is believable as an equal match for our hero. Of course Amy Adams is always a welcome addition to any film. 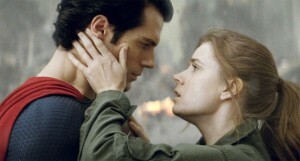 She’s a good choice for Lois Lane as the character’s combination of spunkiness and vulnerability is effortless for her. As mentioned, Kevin Costner and Diane Lane are wonderful in their scenes and give the film much-needed heart. Russell Crowe does that stoic thing he does and becomes even more stoic as he makes appearances throughout the film as a virtual version of Jor-El. The movie is also jam-packed with familiar faces in supporting roles, Laurence Fishbourne, Richard Schiff and Christopher Meloni to name a few. There was no doubt this was going to be a much darker and more reality-based take on the Superman story than ever depicted before (just the attachment of Christopher Nolan’s name pretty much solidifies that) and it was a smart move since we are living in a different world now than even only seven years ago, let alone thirty-five. It makes sense that the government would initially view Superman more as a threat than an ally. It makes sense that Superman would be a little more conflicted about his abilities and his place in world that he now lives. But in making a grittier and more serious Superman movie, Snyder sacrifices a lot of the fun and charm of what makes the character and the world of the character so endearing. Save for a wink-wink-nudge at the end, we never get to see the goofy, bumbling Daily Planet reporter Clark Kent we’ve come to know and love. While this spares us from the age old question: Hey ‘ace reporter,’ Lois Lane, what’s up with that?- it’s still a huge element of the original story that is drastically changed here and the chemistry between Clark and Lois feels forced without it. There’s very little comic relief and few attempts at humor feel tacked-on and fall flat, particularly a facepalmer at the end (you’ll know it when you hear it). I’m not saying they needed to add CGI Richard Pryor, but a little more of a balance would have added a bit of momentary lightheartedness to the overly serious and cold feeling CGI spectacle. Speaking of CGI, pop quiz time kids! 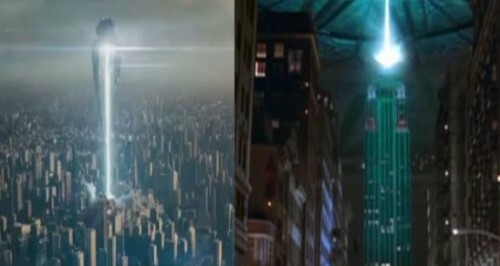 One of the below photos is from Man of Steel and one is from Independence Day. Quick, which is which? General Zod and his cohorts’ grand entrance and the destruction that follows is so reminiscent of the alien invasion in the 1996 blockbuster I was half-expecting Bill Pullman to show up and make an inspirational speech. Let’s talk about that destruction. Look, mass demolition of big cities is nothing new to these kind of movies. It’s an easy way to display the stakes our hero is up against and show the audience just how bad the bad guys are. It’s been done so many times that we’ve become desensitized to it. Even after something very similar happened in real-life twelve years ago. Try this one. Which of these photos is a still from Man of Steel and which is a real photo taken in New York City on September 11, 2001? It’s hard to deny that many of the images during the leveling of the fictional Metropolis are a little too eerily similar to the very real events of that tragic day and for me (and I’m sure many others) it felt exploitative. Especially one extended scene of a supporting character (which doesn’t hold much emotional weight since we never get to know much about them) trapped under the ash and rubble of a fallen building. There is no way this was a coincidence. While imagery like this may have been escapism (“That would never happen!”) in a pre-9/11 world, they just feel like a cheap attempt to evoke emotion now. Just cut it out already Hollywood. Okay, so what I’m being overly-sensitive here? Fine, let’s say I am. Let’s suspend disbelief and accept everything shown as a necessary part of the story and fast forward to the big showdown between Superman and Zod flying high atop the city and beating the hell out of each other while smashing one another’s bodies into buildings with such super-strength that the buildings crumble upon impact. Though we don’t ever see them, surely there are people inside all of those buildings, right? Now Zod couldn’t give two shits about collateral damage, he wants to wipe out the entire human race after all – but wait a minute- shouldn’t Superman care about the hundred of thousands of innocent victims? Isn’t keeping people out of harm’s way, I don’t know, what he does? While many of the flashbacks work very well, the non-linear storytelling and jumping around between locations is hard to follow at times. 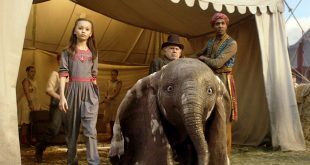 Cuts from one exotic location to another are so erratic they feel jarring and take the viewer out of the story to play catch-up. Add in convoluted scientific mumbo jumbo, out of the blue plot contrivances, uneven pacing, instant solutions (at one point Lois suddenly announces something to the effect of “We’ve figured out a solution!”), and like the action sequences, it’s all just too much at once. While effective at building the foundation for a successful franchise and featuring solid performances by an exceptionally capable cast, Man of Steel just isn’t as much fun as it should be. The dour tone doesn’t work as well for Superman as it did for Batman, a much darker character. Some will love it, some will hate it. Those too young to have been brought up on the Christopher Reeve films of the 70’s and 80’s will likely receive it better. Still, it has some good moments and many of the effects are no doubt impressive (when the camera manages to stay still for more than two seconds). I’m interested to see where the series goes next. Take a Drink: whenever you check your watch. Take a Drink: at every “subtle” religious metaphor. Take Two: when they don’t even try to make it a metaphor. Take a Drink: every time pop-up Russell Crowe appears. Take a Drink: every time Michael Shannon bugs his eyes out. Take a Drink: at every obvious product placement. Take a Drink: when you hear a song from the Singles soundtrack. 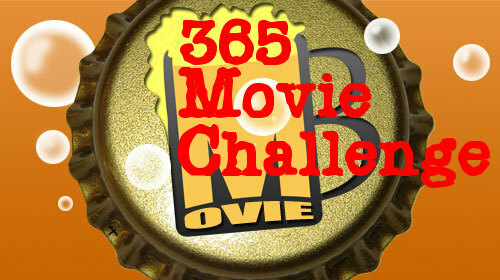 Last call: Stick around after the credits end for a hilarious blooper reel set to “Kryptonite” by 3 Doors Down! 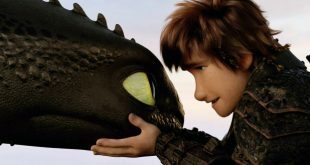 I would have liked a bit more of the backstory as well- those were the most compelling parts of the film for me by far. I also was generally quite entertained by Man of Steel, but the points BabyRuth brings up in Beer Four are very compelling, and explain that slight bad taste I had in my mouth during the finale. Thanks for reading and taking the time to comment. This one sure sparked a lot of debate. I can understand how some people would have liked it, but for me, I was letdown. I am still hopeful for the next film. I’m hoping there will be at least some acknowledgement of this in the next one. This is exactly what I was thinking throughout the entire movie. When you look at different aspects of the movie it wasn’t ALL that bad. I just felt that the bad parts (basically exactly what you mentioned here) completely ruined the parts that were actually good. 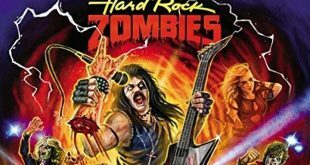 I see 2 – 3 movies every week in the cinema as new movies come out, and this was the first movie in about five years that I left the theatre being thoroughly disappointed. Maybe my expectations were just too high for such a huge franchise movie, but it was not what I was expecting at all and I feel it could have been done loads better.